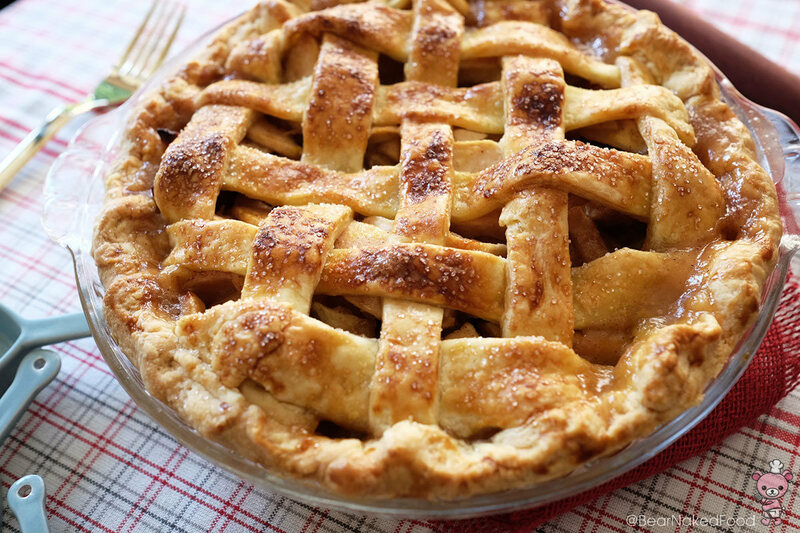 As much as I love fruit pies, apple pie definitely ranks no. 1 in our household. 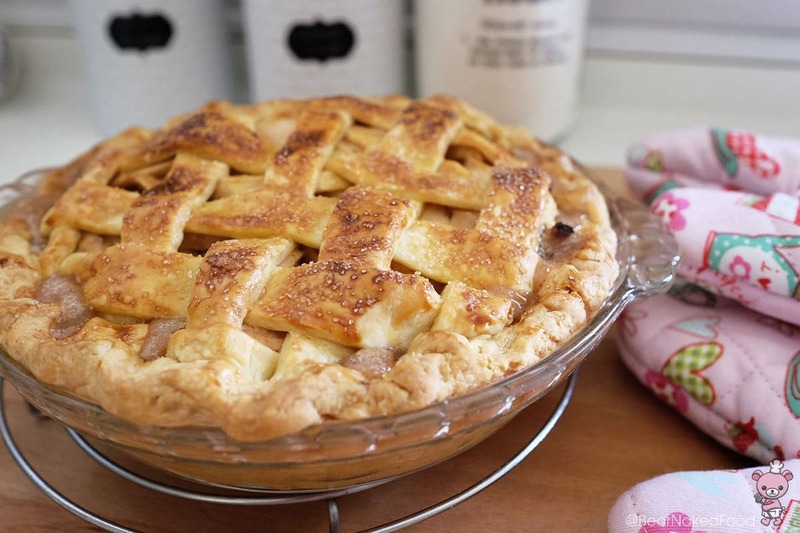 Thankfully, apples are available all year round in Singapore so I have every reason to make this Salted Caramel Apple Pie. 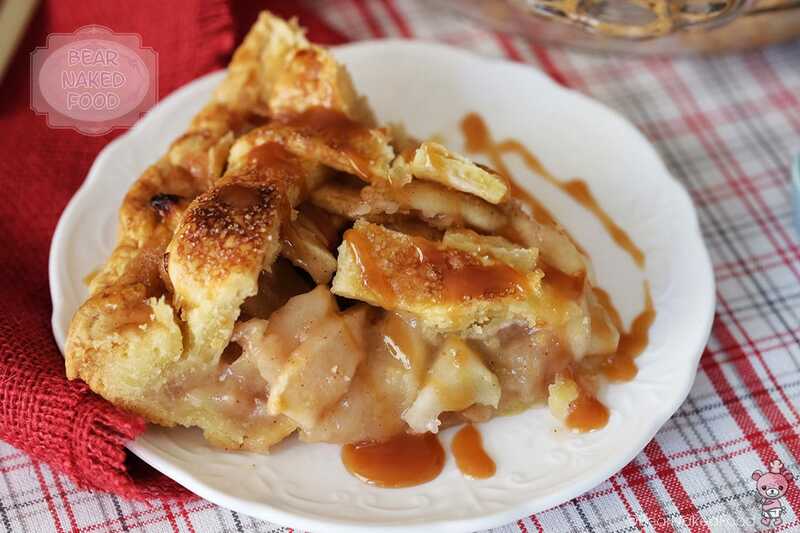 Thanks to the addition of salted caramel, the savory-sweet combo of the apple pie filling is simply one of the best filling I ever had. 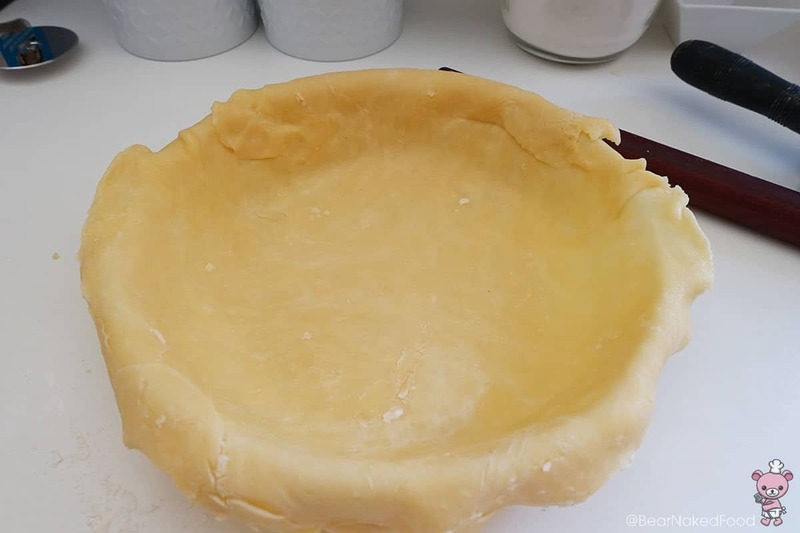 Making the crust, also known as short crust pastry is really the essential part of a delicious pie. 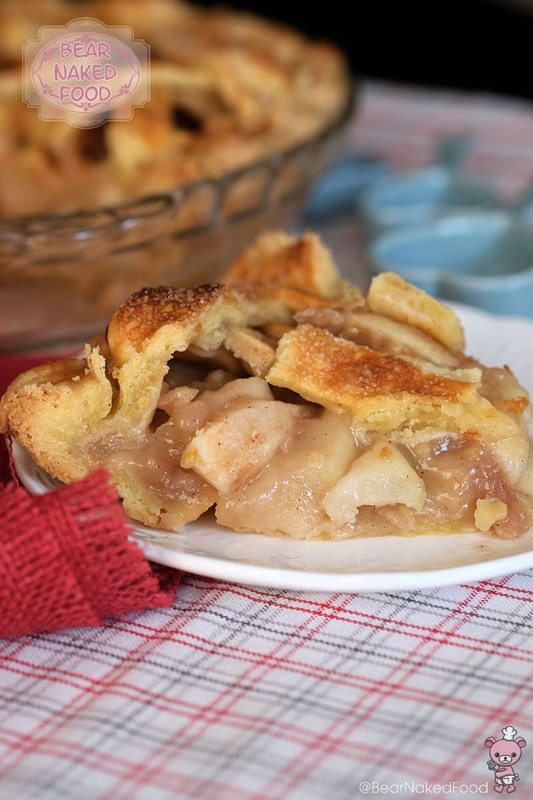 If you follow the steps below, you’ll be rewarded with a light and flaky crust. I can’t decide which I like better – crust or filling. Oh, the lattice top is totally optional but visually, it does add a few more points to this wonderfully scrumptious pie, right? The line up for pie dough. The line up for pie filling. 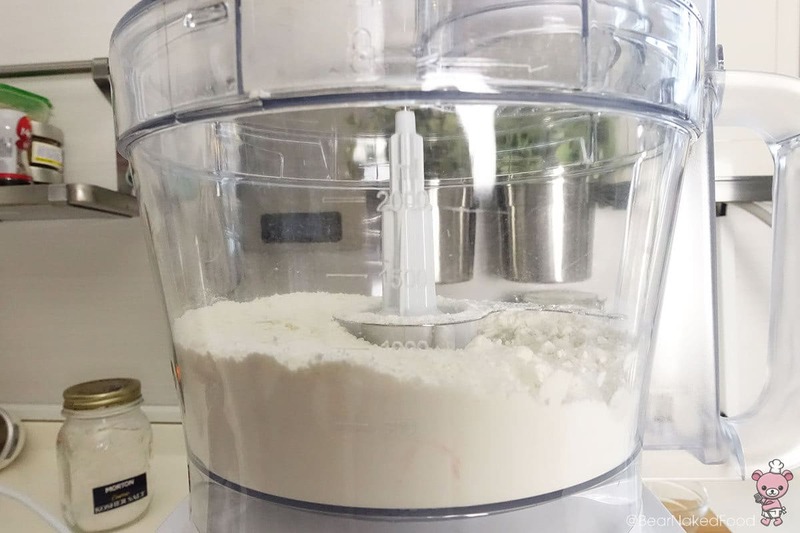 Add the flour, salt, sugar together into a food processor and pulse it a few times until well combined. 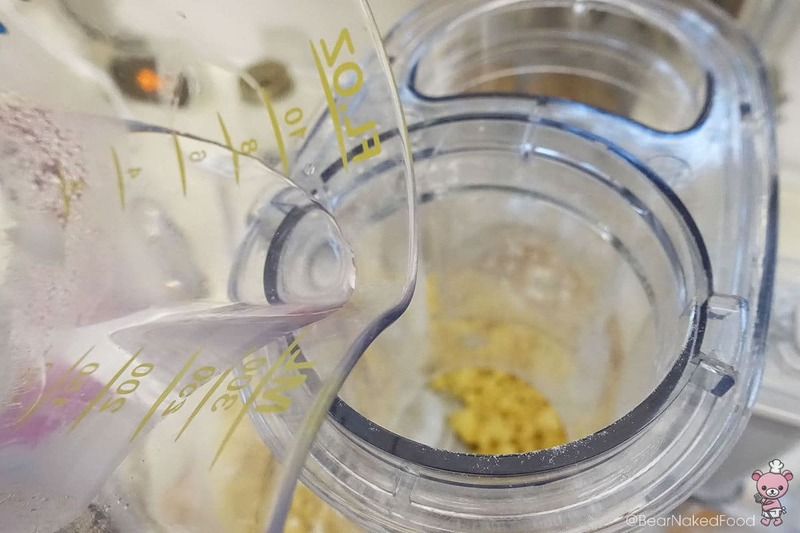 Add in cold butter cubes and pulse into coarse crumbs. Do not overmix. Like so. 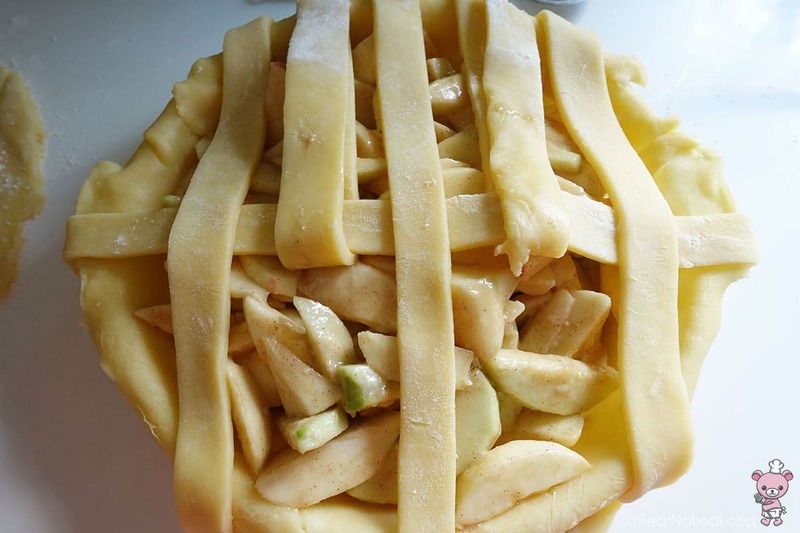 Overmixing will result in a hard crust. With the food processor still on, slowly drizzle in some iced water until the dough just comes together. It will appear lumpy and that’s ok as we will be forming it together with our hands. 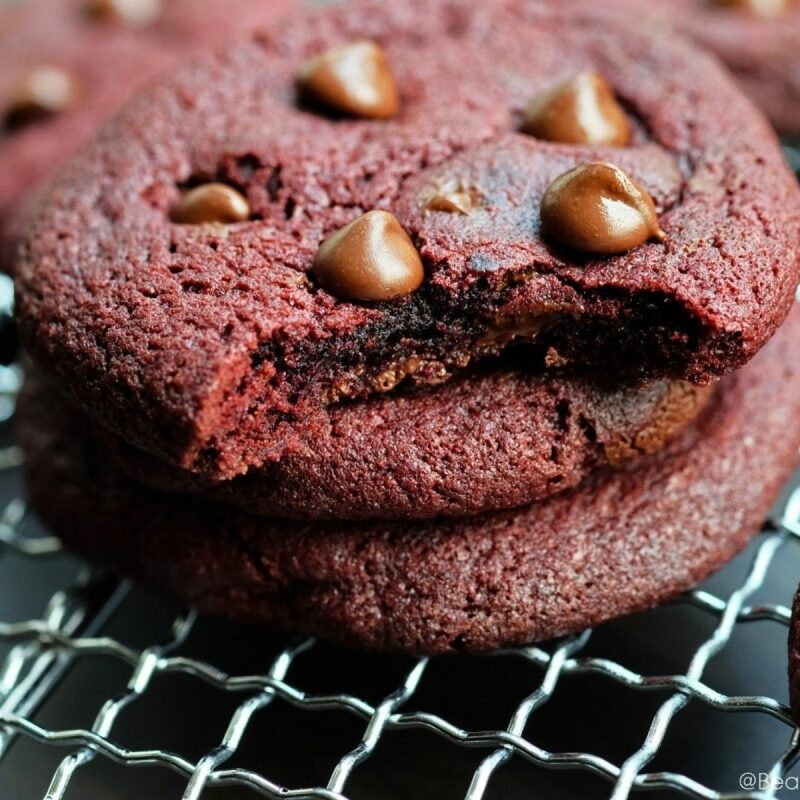 If you overmix, the dough will be too soft to work with. 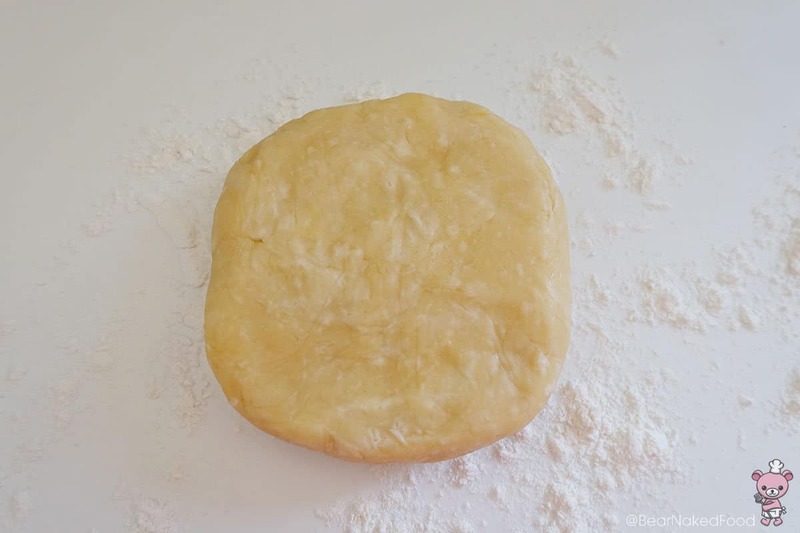 Turn the dough out onto a clean lightly floured surface. 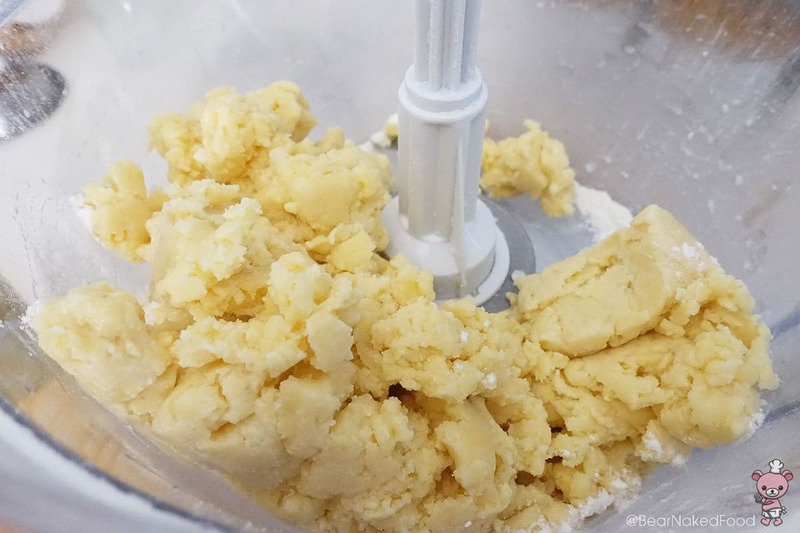 Using your hands, gently knead the dough together. Weigh and divide into 2 portions. 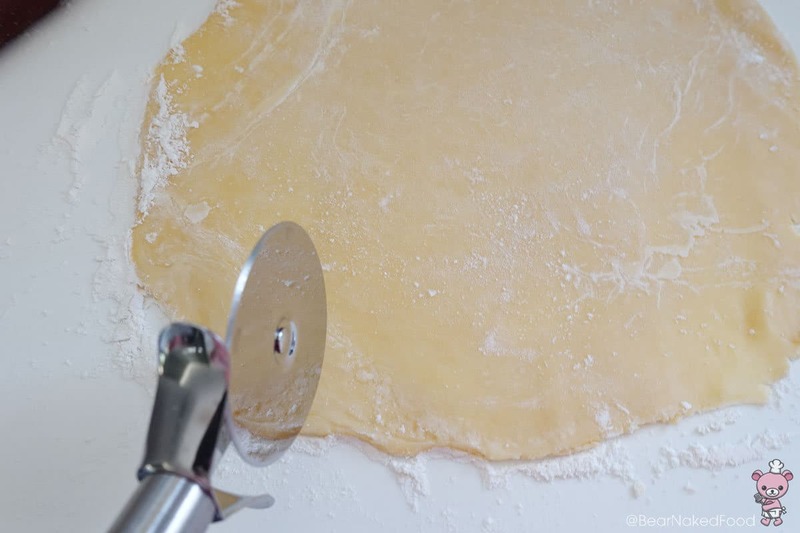 Flatten into a disc shape and wrap with cling wrap. 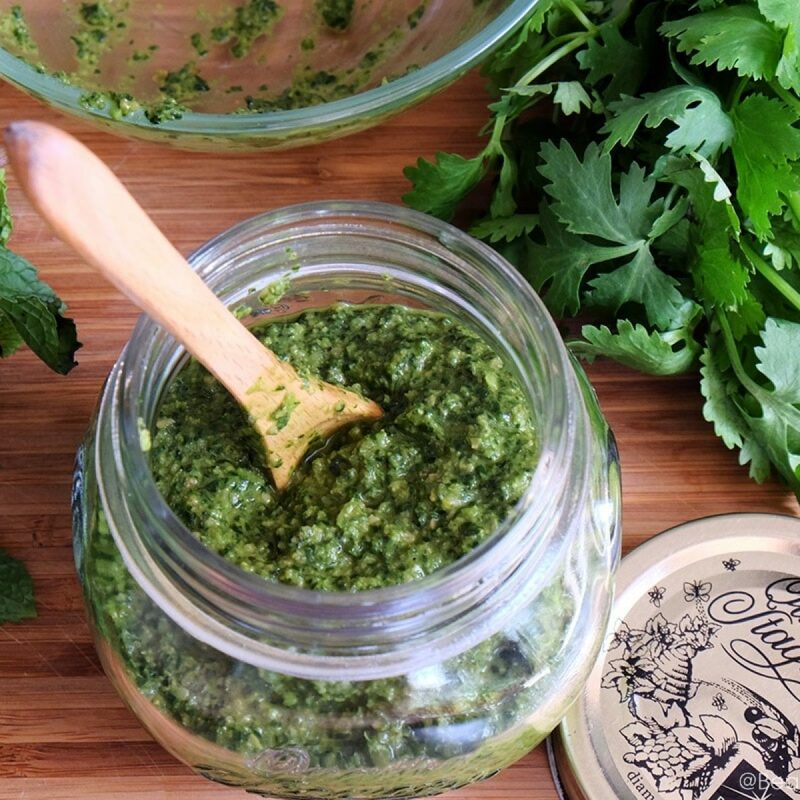 Relax the gluten in the fridge for 1 hour or overnight. 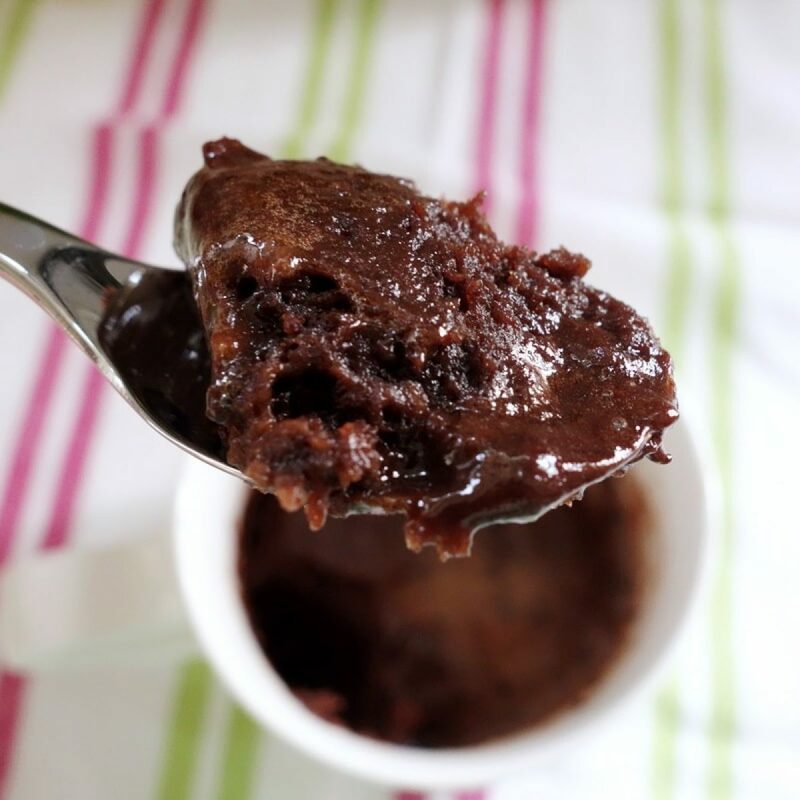 You could also freeze the dough for a month and defrost in the fridge before to use. 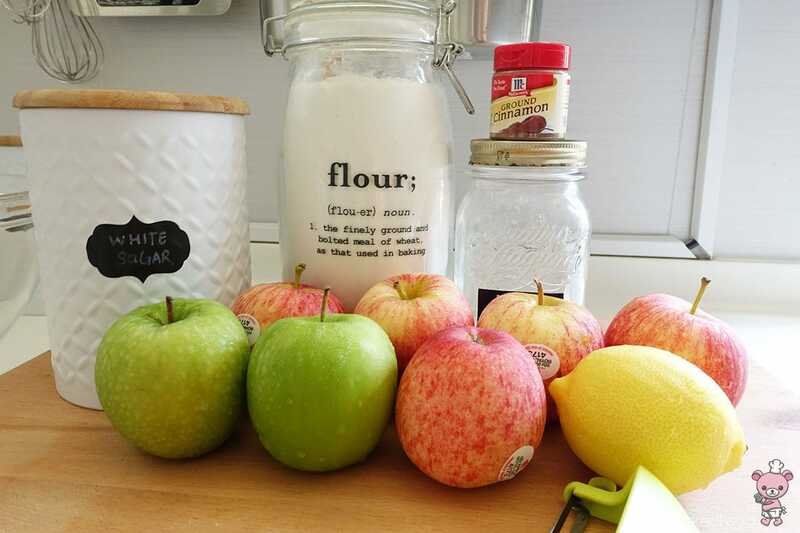 Prepare the filling by combining the sliced apples, sugar, cinnamon, lemon juice, all-purpose flour together. Mix well. 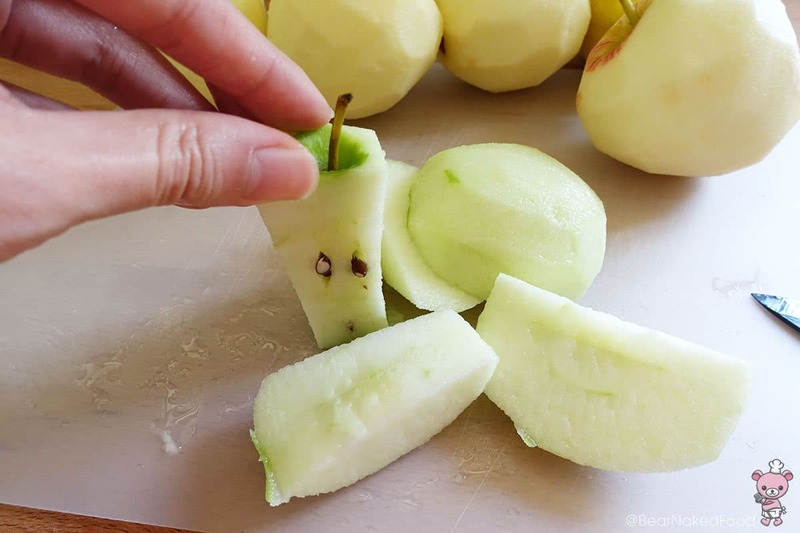 Cut the apples into wedges. Discard the core. 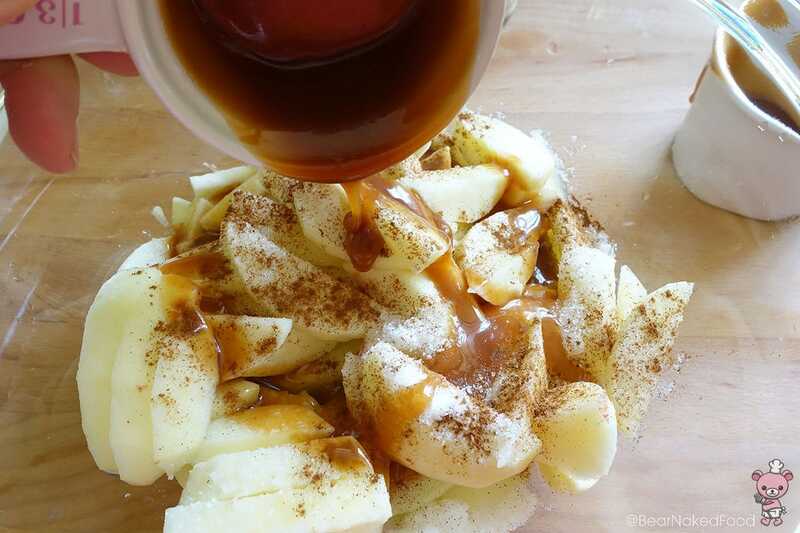 Add in caramel sauce and give it a final mix. Set aside. 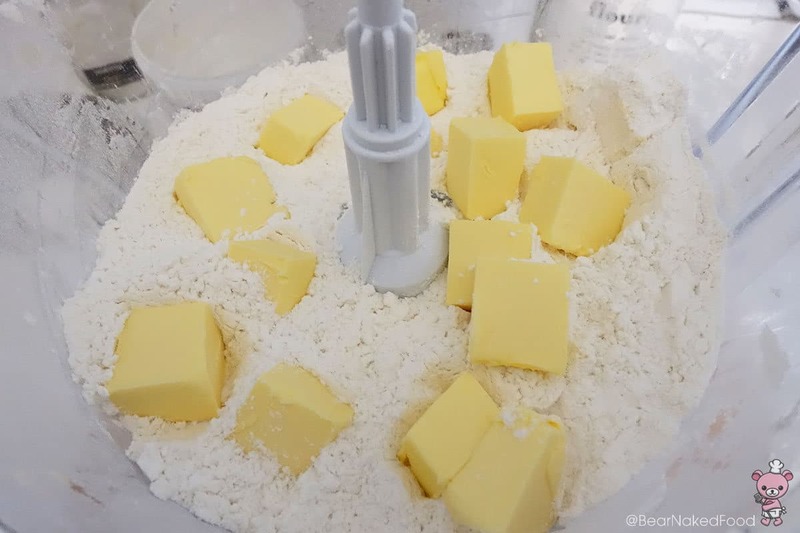 Dust the work surface with flour and roll out the chilled dough. It will be hard to roll it out at first but keep working on it and it should be pliable within 5 – 7 mins. 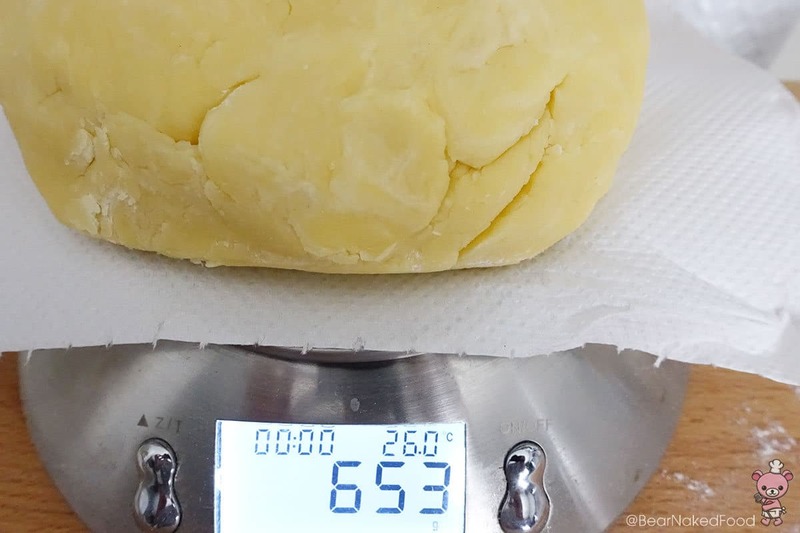 If the dough is left out at room temperature for too long (especially in warm and humid weather), it will be too soft and difficult to work on. 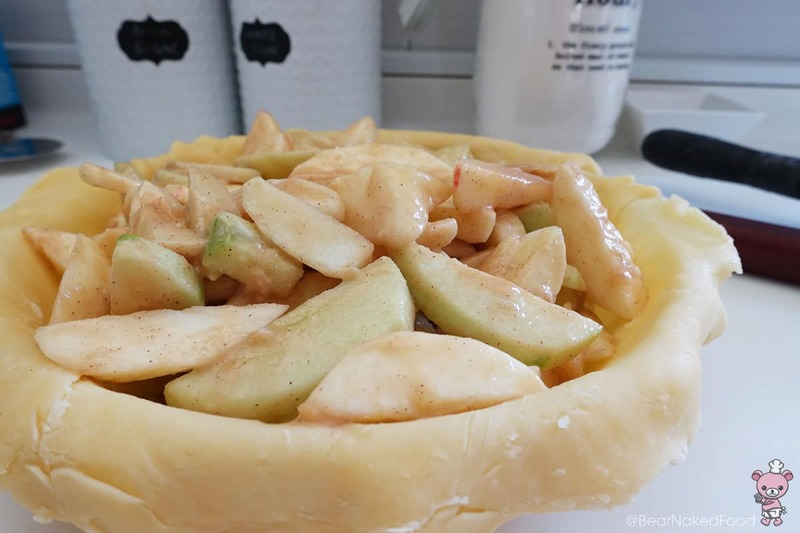 The dimension of the dough should be slightly bigger than the 7-inch pie dish. 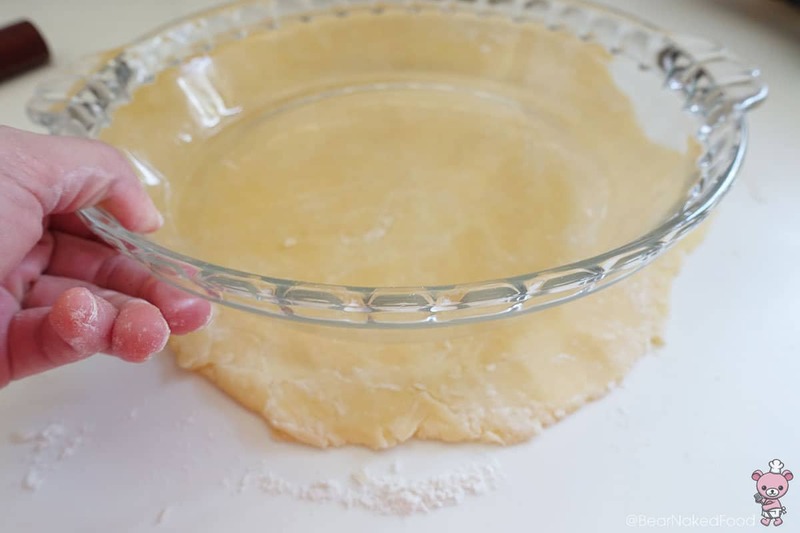 Gently place the dough on the rolling pin and transfer into the pie dish. Press the dough so that it’ll fit around the pie dish. 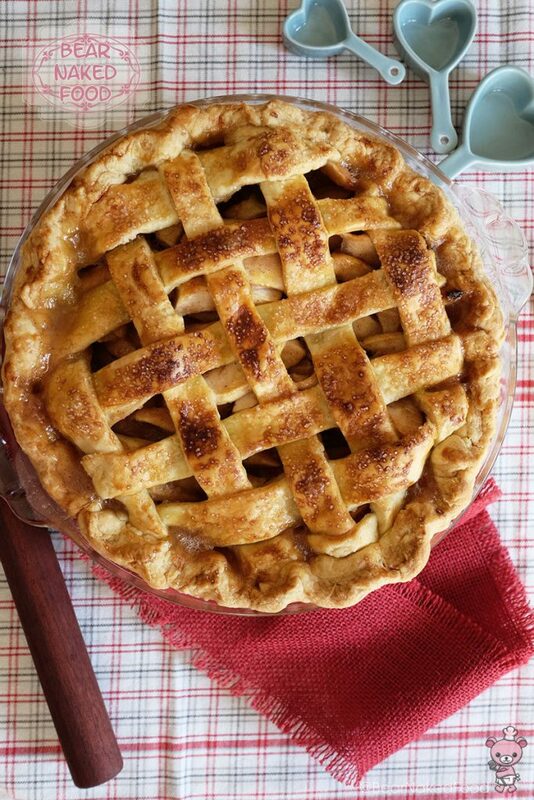 Fill with apples and set aside. 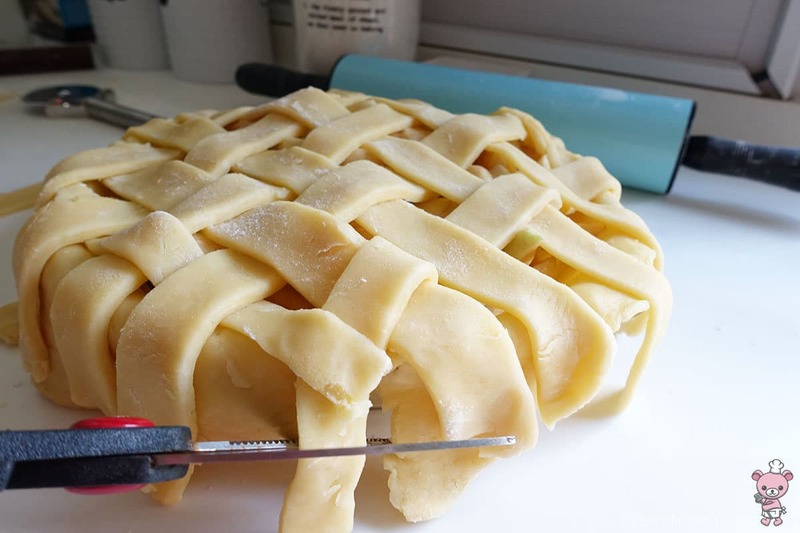 Since my kitchen is rather warm, I left it in the fridge while prepare the lattice. Roll out the 2nd dough into a large round disc approx. the same size as the first, about 1/8 inch thickness. 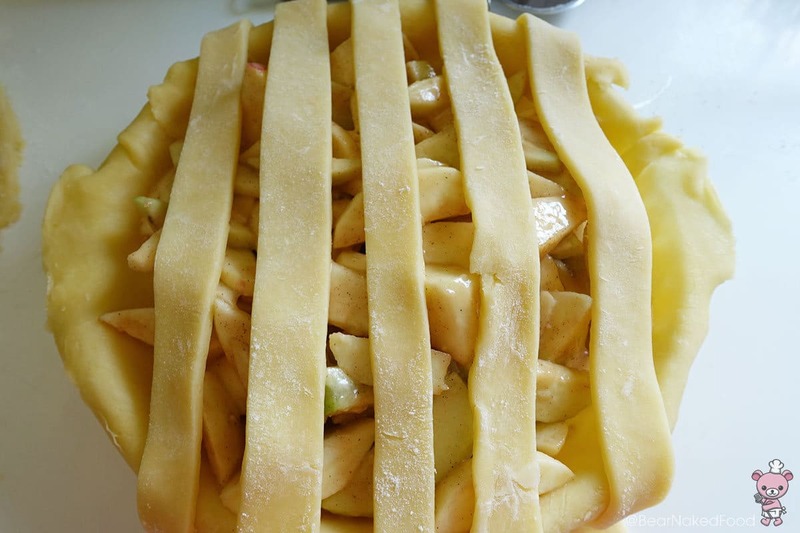 Using a pastry cutter or long knife, cut 10 x ½ inch strips. 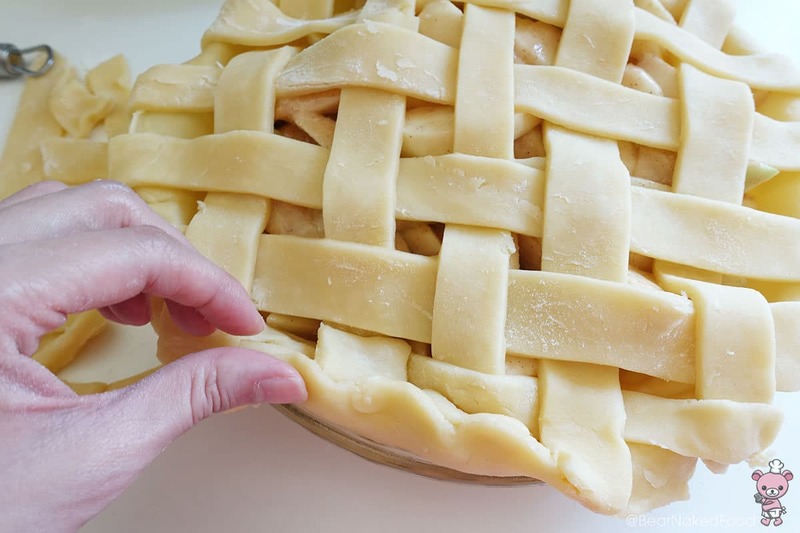 Place the longest strip in the middle of the pie, follow by another 4 strips. Unfold 3 strips (alternate) halfway and place a strip horizontally on top. Fold back down. Repeat with the rest of the 4 strips. 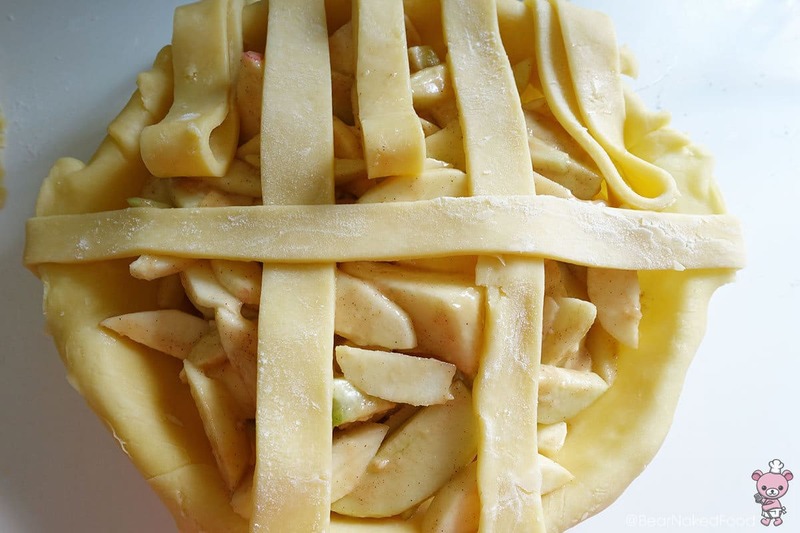 Trim off the loose edges and crimp the edges of the crust inwards. 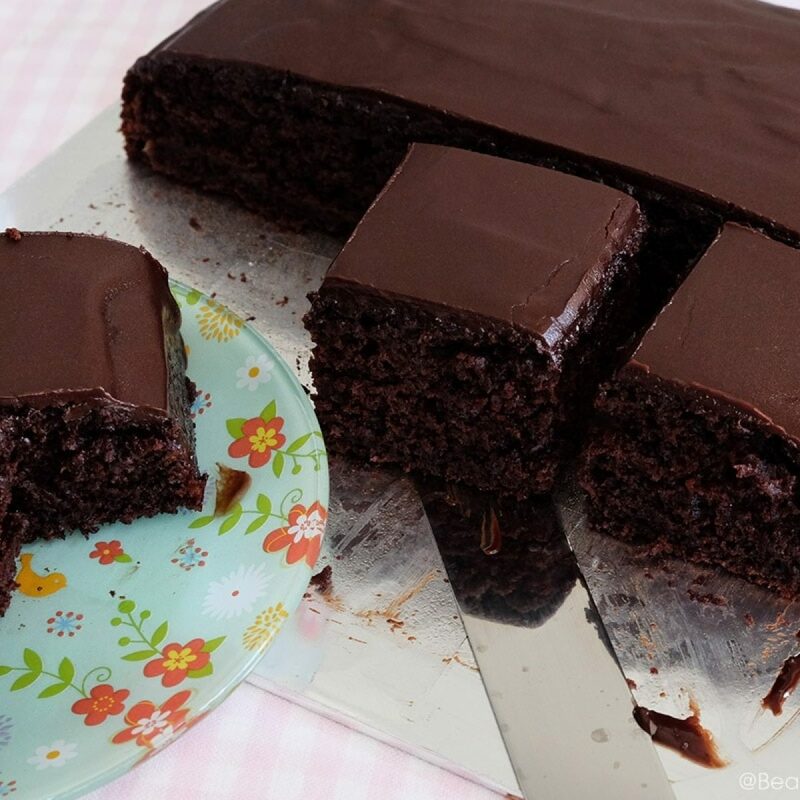 You could press the edges with a fork for a fancier pattern. 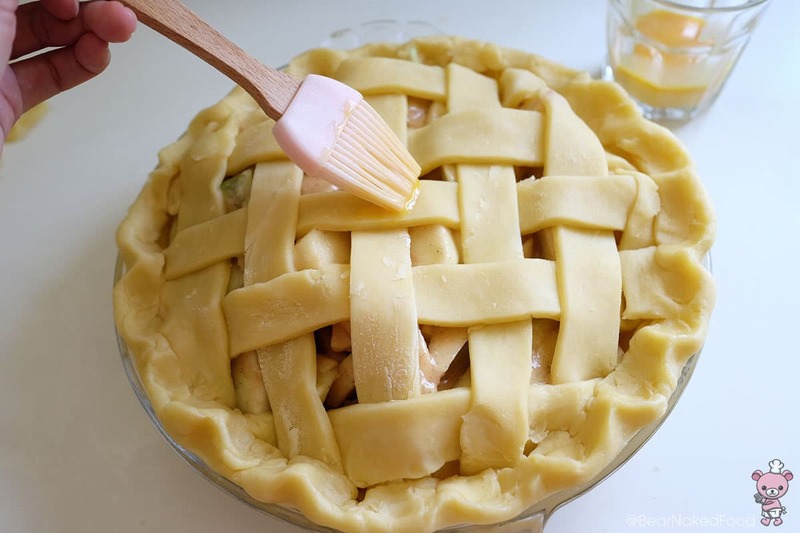 Brush egg wash all over the lattice and the sides. Sprinkle with fine grain granulated sugar and a pinch of salt. 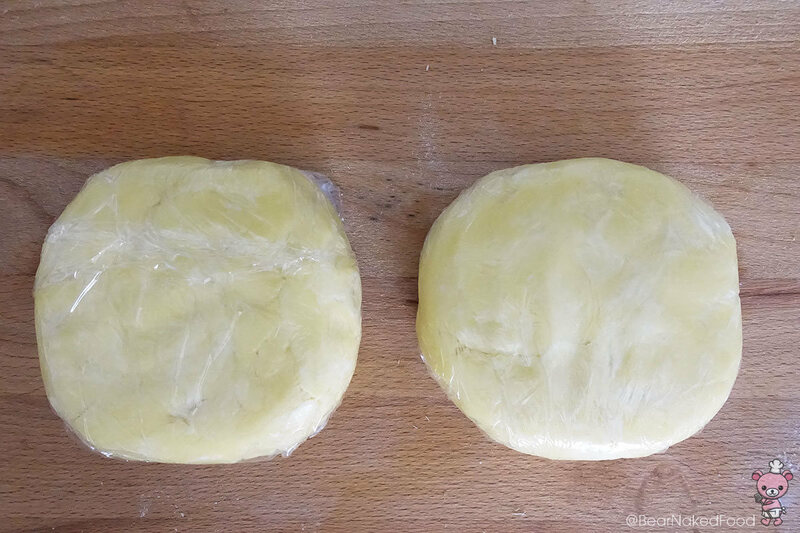 Place in freezer for 20 mins to firm up the dough. 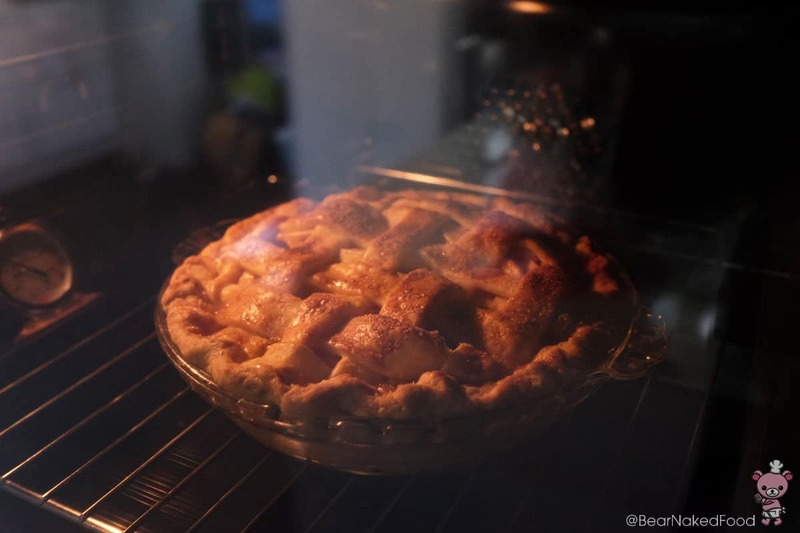 Preheat oven to 190°C/375°F and bake the pie for 1 hr 15 mins or until centre is bubbling and bottom crust is golden brown. 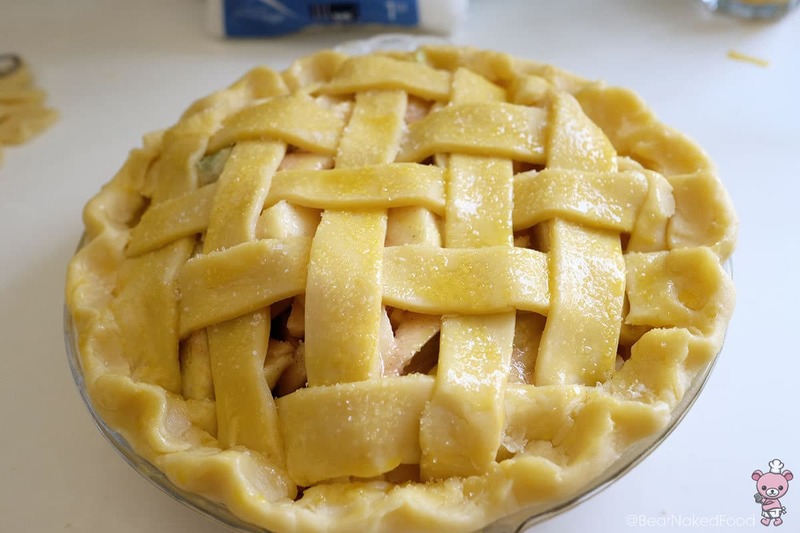 If the top is browning too quickly, cover with an aluminum foil. Allow to cool completely for 4 hours before serving. Add in butter cubes and pulse into coarse crumbs. Do not overmix. With the food processor still on, slowly drizzle in some iced water until the dough just comes together. It will appear lumpy and that’s ok as we will be forming it together with our hands. 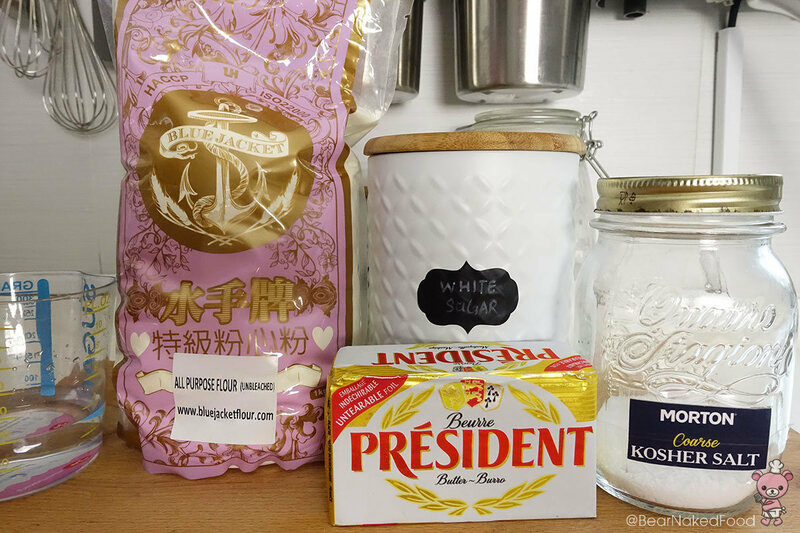 If you overmix, the dough will be too soft to work with. Flatten into a disc shape and wrap with cling wrap. 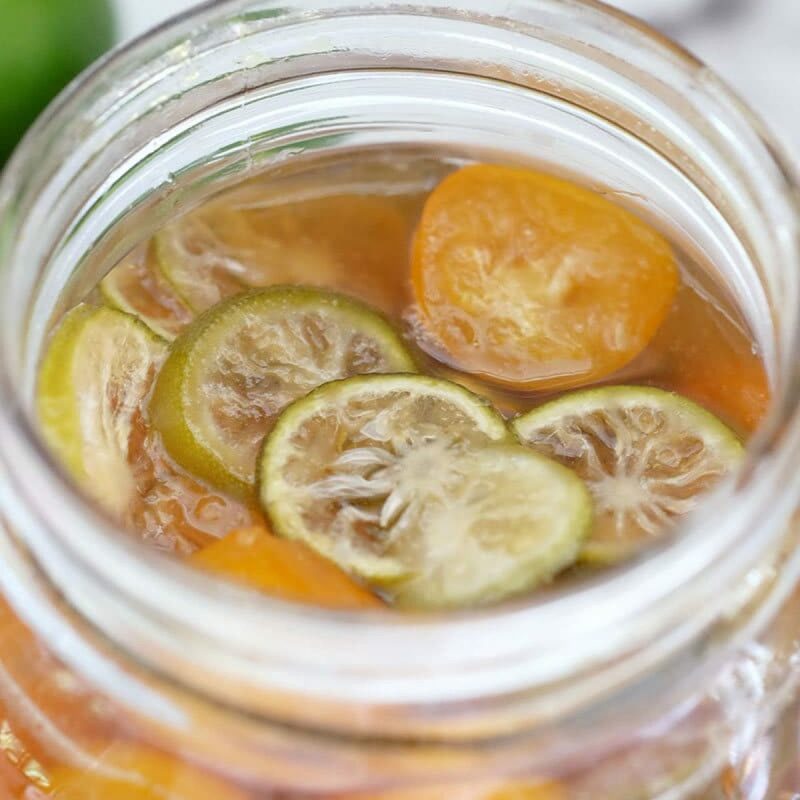 Relax the gluten in the fridge for 1 hour or overnight. 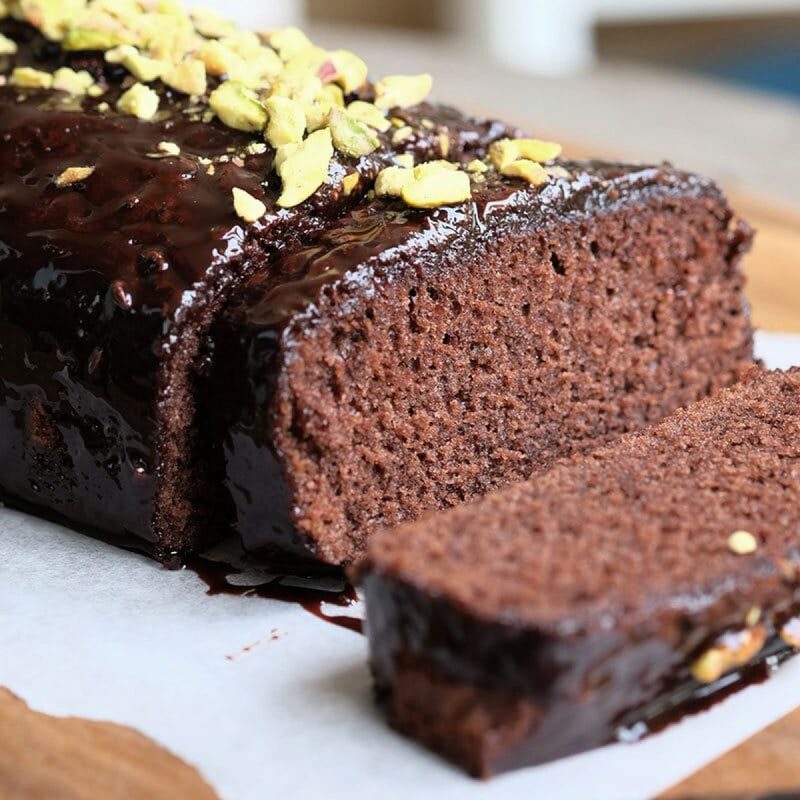 You could also freeze the dough for a month and defrost in the fridge before to use. 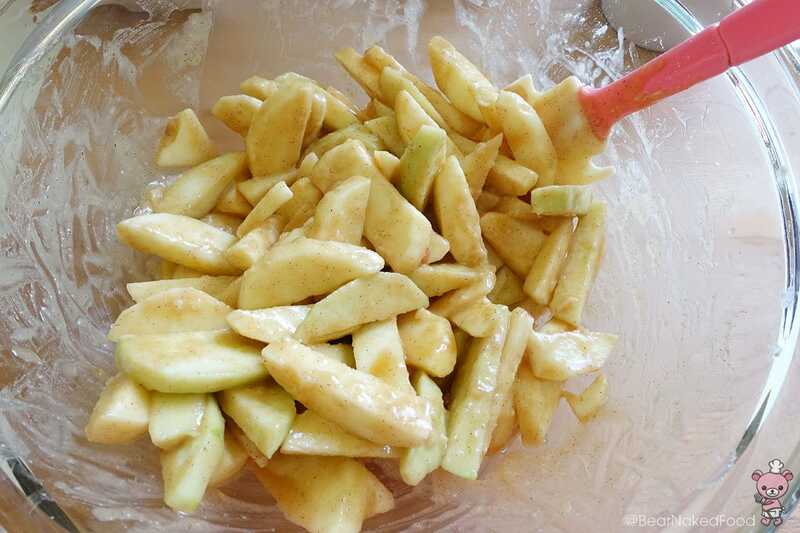 Prepare the filling by combing the sliced apples, sugar, cinnamon, lemon juice, all-purpose flour together. Mix well. 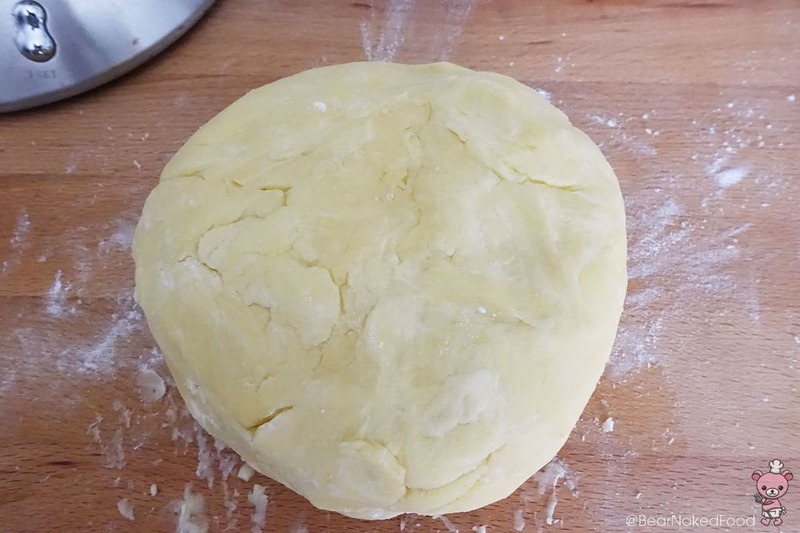 Dust the work surface with flour and roll out the chilled dough. It will be hard to roll it out at first but keep working on it and it should be pliable within 5 – 7 mins. 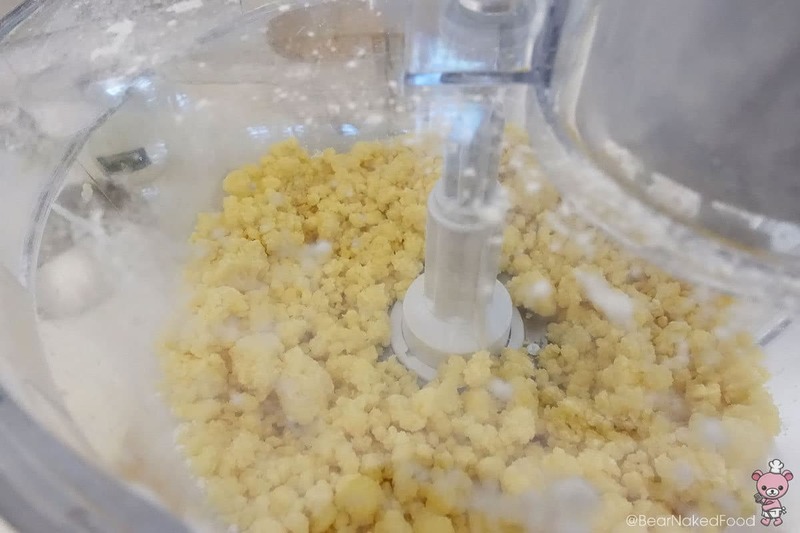 If the dough is left out at room temperature for too long (especially in warm and humid weather), it will be too soft and difficult to work on. Roll out the 2nd dough into a large round disc approx. the same size as the first, about ⅛inch thickness.